Rogue Creamery is located in the beautiful Rogue Valley of Southern Oregon, and over the last half century has introduced 10 distinctive varieties of hand-crafted artisan blue cheeses and a variety of gourmet cheddars. Rogue Creamery's handmade cheese is produced from certified organic pasteurized milk and made using old world sustainable practices. Sustainable agriculture integrates three main goals - environmental health, animal welfare, and social and economic equity. Stewardship of natural, environmental, herd, and human resources is of prime importance to a sustainable organization. 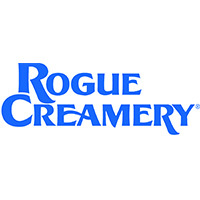 Rogue Creamery ensures a consistently delicious and healthful experience through its commitment to sustainability and food safety which are third-party certified. Rogue Creamery's Mission: People dedicated to sustainability, service, and the art and tradition of creating the world's finest handmade cheese. David Gremmels is the President of Rogue Creamery, an artisan cheese company that produces the finest blue cheeses in the world. He is a leader in promoting and supporting American cheeses, sustainability, and organic agriculture. He resurrected a Northwest staple, Oregon Blue, and in the last 15 years introduced 20 brands including Smokey Blue & Caveman Blue. In 2016, Rogue Creamery transitioned all their cheeses to organic using milk from their own organic dairy. 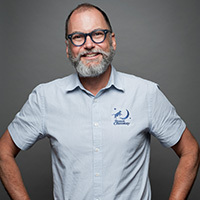 David is a Board Director of the American Cheese Society Education Foundation, former President and Chairman of the American Cheese Society, and current Ambassadeur, VP and Secretary of the North American Chapter of the Guilde Internationale des Fromagers. In 2015, the Specialty Food Association honored him with the NASFT's Leadership Award, and in 2016, David was elected to the SFA's Board of Directors. David serves on the Governor's Sustainability Board of Oregon and currently serves on the Board of Directors of the United Way of Jackson County. He is the recipient of the 2010 Excellence in Marketing award from the Oregon Department of Agriculture. In 2014, he facilitated Rogue Creamery's move into becoming Oregon's first business to be registered as a social Benefit Company. Rogue's Smokey Blue gets its distinctive taste from a long, gentle cold-smoking over shells from Oregon. Hazelnuts infuse Rogue's Smokey Blue with an added layer of rich ﬂavor and terroir. Sweet cream ﬂavors and caramel notes balance earthy ﬂavors of smoke and hints of roasted nuts. The result is smooth blue cheese reminiscent of candied bacon. The smooth yielding texture of the paste and clearly defined blue veins are reminiscent of the great Gorgonzola, but the bouquet of fruit, brothy mushroom, sweet cream, and tangy fruit flavors set it apart as an American original. Although its moniker and mold-riddled exterior imply a lack of refinement, these wheels are anything but. A rugged natural rind allows the Caveman to release a bit of moisture and develop a thick, buttery texture. During its maturation, luscious cow milk and blue cultures are transformed into a golden-hued paste that tastes of sweet, fresh buttermilk with hints of tropical fruit, grass and hay. This blue reflects a deep connection to the land and artisanship. These rounds are lovingly hand-wrapped in local, organic, biodynamic Cowhorn Vineyard Syrah leaves that have been macerated in organic Pear Liqueur. Rogue River Blue is made during the autumnal equinox and before the winter solstice from Brown Swiss and Holstein cow milk. The cows graze in 1250-foot-elevation pastures bordering Rogue River, where they eat a variety of pasture and native grasses, hop clover, wild herbs, Himalayan blackberries and wild flowers, supplemented with grass hay, alfalfa and grain off the farm. Rogue Creamery's Original Blue features a rich and buttery taste with notes of huckleberry and sweet nuts. It melds flawlessly with a smooth, well balanced, medium bodied red wine and culminates with a broad, savory finish. Two great loves of the Rogue Creamery team come together in one delicious cheese: Chocolate Stout and our classic hand-milled Cheddar. The ale is poured over the curd and allowed to meld, and then it's hand-dipped and pressed into blocks for aging. Savory and tangy cheddar notes are tempered by the sweeter chocolate and espresso flavors of the stout.